Both of my boys are vehicle mad from trains to lorry's, cars tractors and cranes they love them in our house they are always whizzing round with something. 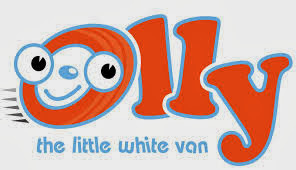 So you can understand when I say they really love Olly the little white van we were asked if we could review one of the DVDs in the range, of course I said yes the boys already have a couple of there DVDs and they are a big hit! its really catchy and has me singing the tune all day after hearing it! Great review thanks - my kids love olly too!